Sadly – you are wrong. It’s time to roll up your sleeves and figure out first whether you are affected, and two, what you need to do about it. When comparing GDPR and CCPA, there are of course some similarities. Individuals have the right to opt out of data selling, and can request data access and demand erasure. Both privacy laws – GDPR and CCPA – do require that organizations review on its service-level agreements, with a view of strengthening where necessary. And these two laws also have steep penalties for those who fail to comply with its laws. While GDPR has a 4% annual turnover cap, the CCPA has not ceiling, guidelines currently set at $7500/infraction, says this report. It would be an expensive oversight. -entity has personal info on more than 50,000 consumers, devices or households. So could that mean that a non-profit in bed with an organization that fits within the CCPA remit could be impacted? Another interesting difference is how each regulatory body defines personal information. The CCPA’s definition of personal information is broader because it also covers electronic network activity. For example, CCPA considers identifiable household, device or IP address information as personal information; GDPR does not. However, where data principles are defined by GDPR, it seems the same cannot be said for CCPA. Unlike GDPR, the CCPA does not contain data processing principles. It imposes less restrictions on what an organization can do internally with personal data. The California Attorney General can issue guidelines on how it should be enforced, and we eagerly await those to see how it will impact affected firms. 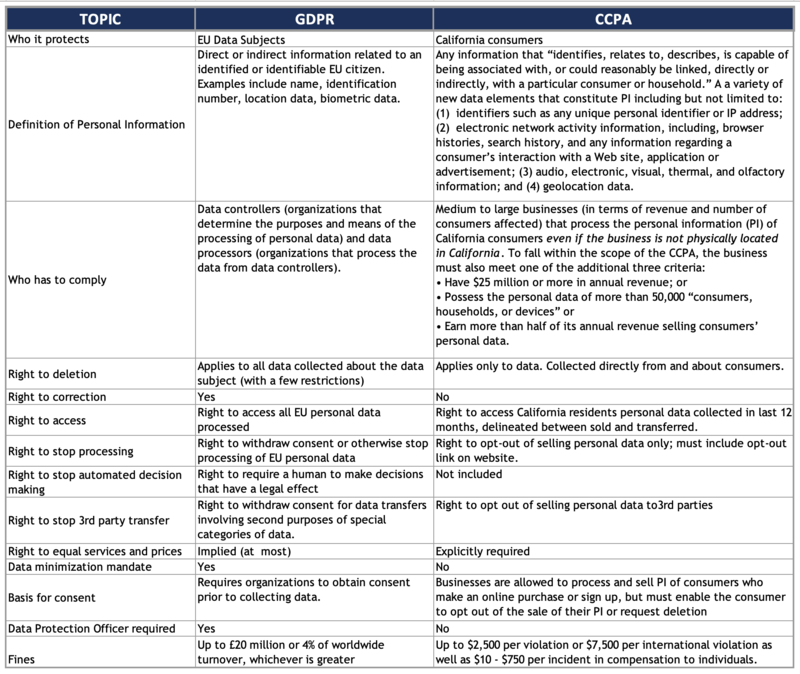 We’ve pulled together for you a handy table to help you better understand the differences between GDPR and CCPA. If you would like further, more in-depth information that applies directly to your situation, please get in touch. We are here to help.